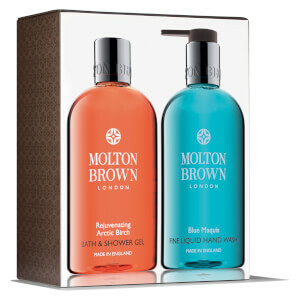 Treat yourself or a loved one to the Rejuvenating Arctic Birch and Blue Maquis Hand & Body Set from Molton Brown. Made in England with the finest ingredients sourced from around the world, the scented duo includes the brand's beloved bath and shower gel and a fine liquid hand wash.
A revitalising formula infused with Birch Bark to cleanse, hydrate and soften skin. 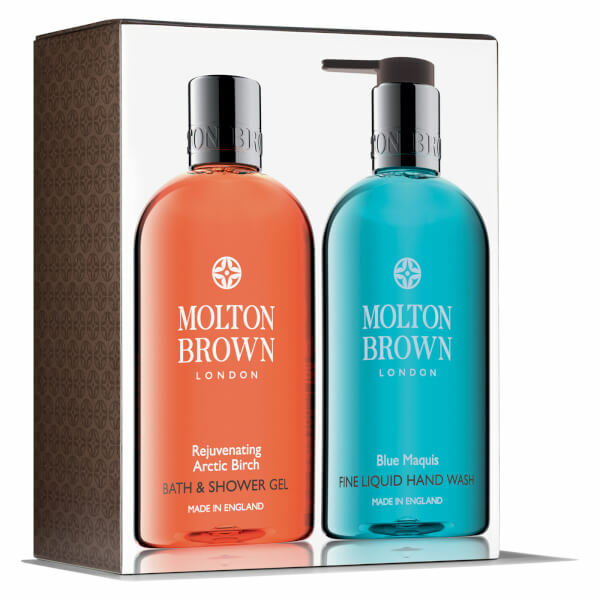 Opening with top notes of Tangerine and Caraway, enhanced by Vetiver and woody Arctic forest aromas. The perfect pick-me-up to leave you ready for the day ahead. Gently eliminate impurities with the luxurious hand wash; a refreshing formula blended with Corsican Pine, Ginger and Rosemary for an invigorating cleansing experience. Imparts a herbaceous fragrance to revitalise the skin and senses with every use.